Oneflow is ecstatic to celebrate the first half of 2019 with an esteemed industry award from FinancesOnline: Premium Usability award for 2019. The Premium Usability award is granted to expertly designed products that offer an exceptional user experience that simplifies the way businesses facilitate their work processes. FinancesOnline backed this recognition with a 100% user satisfaction rating for Oneflow. True enough, our software makes the lives of businesses easier by equipping them with the essential tools for building, monitoring, and sending e-sign documents, all of which are available in one simple and straightforward Oneflow pricing option. In the comprehensive review prepared by FinancesOnline, their software experts vouched for Oneflow’s capability to improve end-to-end contract processes. According to FinancesOnline, Oneflow “transforms” contract conversations with clients through its live contract editing capability. As stated by their experts, the live contract editing not only eliminates needless back-and-forth client communications but also allows for real-time negotiations. Another benefit of Oneflow, according to Financesonline, is its interactive proposals. Because customers are able to browse your offerings while viewing your pricing tables, they are empowered to avail more of your products or services. 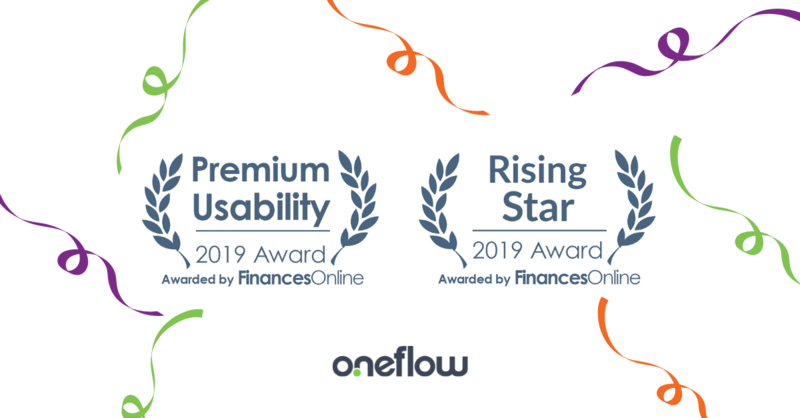 Last but not least, FinancesOnline had a major surprise for Oneflow in the form of another industry award: Rising Star for 2019. FinancesOnline not only prepares first-hand sales proposal automation software reviews, but they also analyze a product’s reception in the market. Their findings were extremely positive, with Oneflow garnering a perfect 100% user satisfaction rating and being considered among the most reliable software alternatives. Overall, Oneflow customers are satisfied to have full control over the contract lifecycle. Visit FinancesOnline to see the review for yourself, understand what is sales proposal automation, and learn more about Oneflow from the eyes of trusted business software analysts. See Oneflow in action - we'll demo how sales proposal automation helps you close deals faster!